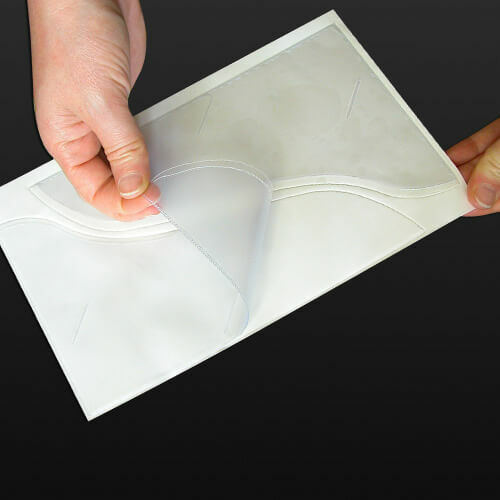 Self adhesive transparent plastic file folder pocket is a practical and convenient product that can be used to attach brochures, bid letters, fliers to the front or back covers of binders, files, catalogues, brochures, etc. They are self adhesive stickers. It is available in semi-transparent and transparent versions. Thanks to its sticker form, it is very easy to remove from the holder and attach to files, catalogues and many more. It is available as half cut it its holder. Hold and remove it from the corner and easily attach to binders, files, catalogues, brochures and many more. Its transparent form protects information on your printed catalogues. It can be used by printers and file manufacturers as well as for personal and business purposes. For file, folder, catalogue etc.